From Die Tagepost, via Kath.net and the Closed Cafeteria. Now it is being read, studied, commented on and examined for possible consequences. The Motu proprio of Pope Benedict XVI which is supposed to revive the Latin Rite, which was last promulgated by Pope John XXIII in 1962 in the official Missale Romanum and whose basics were defined by the Council of Trent (1545-1563), is making its way through the global Church. More can be found here and here. And always at Rorate Cæli. Cantate Domino canticum. . .uh, antiquum? For anyone interested in learning the basics of Gregorian Chant, the Choir of Madonna del Sasso Parish in Salinas, California, will hold a Gregorian Chant workshop on September 14-15. After attending the sessions from 6-9 pm on Friday, September 14, and 9 am to 4 pm on Saturday, September 15, participants will sing at the Parish 4 pm Vigil Mass. Participants will learn the basics of chant under the direction of Kathy Reinheimer, the Director of the Regina Pacis Cantorum choir and Sursum Corda schola, which sing throughout the Diocese of Reno and the Sierra foothills of California. Registration is $25 (clergy and religious, free!). For further information, please contact Greg Plese at gaius_iulius@yahoo.com, or call 831-569-0769. VATICAN CITY, JUN 28, 2007 (VIS) - Given below is the text of a communique released today by the Holy See Press Office concerning Benedict XVI's forthcoming "Motu Proprio" on the use of the Missal promulgated by Blessed John XXIII in 1962. You may have noticed the "Ron Paul President '08" button on the blogroll. No, The Inn has not gone all libertarian on you. But there isn't a distributist candidate and Congressman Paul seems to me to be the best of the available Republican lot. One would love to have an old-time Democrat to vote for. You can just about make out the text of the Al Smith campaign button that has adorned the bottom of the blogroll for the past couple of years. But the sorry lot that have taken over Governor Smith's party have made a Democrat vote from me a near impossibility. So, for now Congressman Paul gets the blogroll endorsement and the couple of bucks that an impoverished reed player can afford to send along. We have been shopping this week and dipping into the savings at a great rate. The household furnishings have been dying the death all at once for the past week. Old age claimed the television on Wednesday, Mary's telephone quit, the little white radio only plays static as of Friday, and the microwave oven refused to cook my breakfast this morning. Rather like the deacon's wonderful one-hoss shay. So we have been shopping. Not spending all that much money to be sure. (Although we have found that one can no longer buy a simple, inexpensive television any more. It has to be thin, the length and width of a garage door, and "HD", whatever that is. Perhaps a Highland Division telly?) But it leaves one eying suspiciously the still functioning appliances which remain. The fridge, for instance, hasn't been looking at all well lately. I wonder if Fr John or Fr Perez would be willing to come out and do a house-blessing? And perhaps a minor exorcism? Freeing souls from Purgatory and annoying Lutherans up and down the eastern seaboard: Cardinal Rigali obtains a plenary indulgence for his Archdiocesan subjects in honour of the Archdiocese's bicentennial. The Philadelphia Inquirer explains* it for you here. Chestertoniana starts appearing in The Inn. The feast of the Immaculate Heart of Mary was yesterday in the Pauline Rite. That's one of the few things that I think the reformers got exactly right. Corpus Christi on a Thursday is as it should be -- a commemoration of the day of its institution, Maundy Thursday. 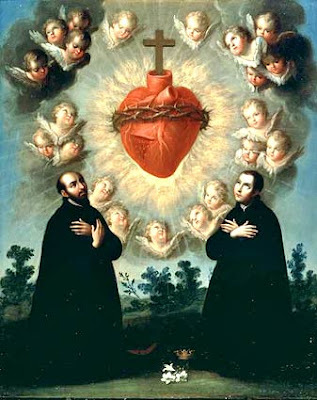 And then the feast of the Sacred Heart is both the octave day of Corpus Christi and a Friday, in commemoration of the day Our Lord's Sacred Heart was pierced with a lance. And this is immediately followed by the feast of the Immaculate Heart of Mary and it also occurs on Saturday, the old devotional day of Our Lady. The Inn does get rather exercized about most of the Pauline reform. But credit where credit is due. This conjunction of feasts is well-thought out and has lovely Catholic devotional resonances. Today is the third Sunday after Pentecost. As feast days go, it doesn't really make the eyes light up and say "howdy". It does have the Good Shepherd Gospel and the "...quia adversarius vester diabolus, tamquam leo rugiens circuit quærens quem devoret!" Epistle, though. So the preacher has a good choice of stem-winders for the sermon. In the picture above you can see something of the ruins of St Moling's old monastery and the Church of Ireland parish church built near it. Most of the Motu Proprio rumours have been third or fourth hand. A reporter says an official says he heard from someone close to the Pope that it is "on its way" on Thursday. Or Saturday. Or on Corpus Christi. Or a week from Tuesday. But this one is a major improvement. We've upgraded to second-hand. The Una Voce delegation heard from the Holy Father himself that the freedom for the traditional Roman Rite is imminent. You can find the (very short) report here. I think we're still subject to a hearsay objection. And maybe a "best evidence" objection. But we're getting there. . . .
That's St Ignatius on the left and I've actually forgotten the Jesuit saint on the right. I would think it ought to be St Margaret Mary's confessor, St Claude de la Columbiere but I don't think it is. I'm about, say, 75% sure it's St John Berchmans. Here is Leo XIII's "Consecration of the Human Race to the Sacred Heart of Jesus" that we used to pray every First Friday and on the Feast of the Sacred Heart. It's not much used any more. The last I heard it used publicly was at First Friday devotions at St Basil's on Wilshire in Los Angeles when Msgr Benjamin Hawkes was still parish priest. Be Thou King of all those who are still involved in the darkness of idolatry and Islamism, and refuse not to draw them all into the light and kingdom of God. Turn Thine eyes of mercy toward the children of that race, once Thy chosen people. Of old they called down upon themselves the Blood of the Savior; may it now descend upon them a laver of redemption and life. Grant, O Lord, to Thy Church, assurance of freedom and immunity from harm; give peace and order to all nations, and make the earth resound from pole to pole with one cry: Praise to the Divine Heart that wrought our salvation: to It be glory and honour foreverl Amen. Beatification of Fr Lucas of St Joseph, O.C.D. and Fr Eduardo of the Child Jesus, O.C.D. Both of the new beati served in what is now the Province of St Joseph in the western United States. "Fr. Lucas was the first Pastor of Holy Family Church in Tucson. He also served at Holy Cross in Morenci, Assumption of the Blessed Virgin Mary in Florence, and Santa Cruz in Tucson. Fr. Eduardo ministered at Holy Family and at Santa Cruz. (He also served as prior of the monastery that our Catalan friars established in Washington, D.C. in 1916). After their return to Spain from the United States, they were martyred during the Spanish Civil War in July, 1936, Fr. Lucas in Barcelona and Fr. Eduardo in Montcada." There is much more information here, including some pictures. Apparently, if you want to imagine St Dominic, one option is to think of Rudy Giuliani. Not everyone's first choice, but according to a few folks encountered by the New Yorker's "Talk of the Town" this week he was the first choice of Renaissance painter Carlo Crivelli (1457 - 1493). Or at least, someone who looks an awful lot like Rudy. You can read the encounter here. You can also find an illustration in black and white of the painting in question here. Catch the resemblance? Me neither. Just two skinny bald guys with thin noses. Maybe if the illustration were in colour. Or maybe you have to be a New Yorker. Or maybe the TOTT's intrepid reporter needs a prescription adjustment on the ole monocle. Mind you, I wouldn't object to Rudy being more like St Dominic. A whole lot more like St Dominic. Rocco points out today that it isn't just cranky traditionalists badgering the postman for that delayed mail from Rome. It seems the Chinese, the new cardinals awaiting a consistory, and assorted Vatican bureaucrats awaiting their promotions/transfers are also waiting anxiously for that long-overdue friendly rattle of the letterbox. 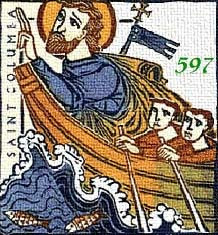 St Columba (or Columcille in the Irish) was the founder of the Iona monastery and the apostle of Christianity to the western isles of Scotland. He was of royal blood and had certain rights to an Irish throne had he not preferred to be monk and priest. The good old Catholic Encyclopædia gives a fine biography of St Columba here. We beseech Thee, O Lord, pour into our hearts the longing for heavenly glory, and grant that we may bear sheaves of righteousness in our hands to that place where Thy holy Abbot Columba shines in brightness with Thee. Through Christ our Lord. Religious life on St Columba's Iona was essentially non-existent after the Reformation. These days it's a growth industry. The Church of Scotland has a monastery (of sorts) there, the Episcopal Church of Scotland has a house, and the Roman Catholic Diocese of Argyll and the Isles has come up with a small facility, too. Poor old Iona also seems to attract lovers of new age bumpf at a fantastic rate. In any event, the island has a website here with some lovely pictures and more information written by someone less depressed by the whole situation than I. There are a few ancient prophecies about Iona. In one, St Columba foresees the devastation of the Reformation and says that Iona will one day be bereft of its monks and be home only to cattle. And, yet, one day it will be as it was. Not quite a prophecy, but Dr Johnson said of Iona during the days of its devastation that "That man is little to be envied. . .whose piety would not grow warmer among the ruins of Iona." The JATVMAS arises from its pallet of misery (flu relapse; tummy version this time; much better now, thank you, but, realistically, you don't want to know much more) to remind you to set your TiVo for "You Can't Take It With You" tomorrow morning: TCM on Saturday 9 June 2007, 06:00 AM EDT but 3:00 AM PDT here in the western edge of the great North American continent. Trinity Sunday is one of the major feasts of the Church but not one that ever made it big where it counts: $$$ No Trinity Sunday white sales, no Trinity Sunday carols being played in the malls with only 10 more shopping days left 'til Trinity Sunday. Not even a deracinated saint or an anthropomorphic rodent to deliver presents the night before. Up until the final reform of the Tridentine breviary in the early '60s (i.e., a few years before its complete replacement by the Pauline liturgy of the hours) Trinity Sunday was distinguished as the last day in the year in which the Athanasian Creed - Quicumque Vult - was recited liturgically. But no more. On an ecumenical scale of 1 - 10 (10 being best) it would only rate a 1. (And it only got the 1 because some Lutherans and Anglicans are rather fond of it.) So The Inn may be the old Creed's only commemoration this year. It's probably not wise to post on a publicly accessibly blog when one is a tad feverish and still a little groggy from an afternoon nap. 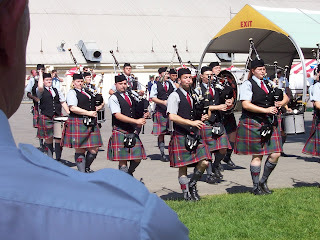 But I really enjoyed our annual highland games last weekend and I haven't even mentioned it yet. I'd like to do that before my newly acquired virus/bacteria takes all the joy out of it and all I care about is another nap. 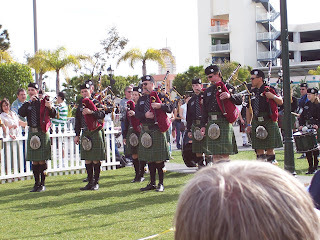 There's a citation on YouTube to L.A. Scots' set but that one cuts off during the march-on tune and you never hear any of their competition piece. As usual, the games are a great opportunity to catch up with old friends who come from all sorts of airts and pairts throughout the southwestern U.S. And I discovered a couple of people outside the the fire-breathing traditionalist milieu who take a look at this effort every now and again. I suppose that means I really ought to mind my pc p's and q's. Probably a forelorn hope. One also needs to visit the vendors and stock up on "supplies". Alas, no-one seemed to have those new wooden reed cases. But there was opportunity to stock up on mint sauce. For some reason, there isn't a market in this area that carries mint sauce. I mean the real stuff: Burgess's or Colman's not the Cross and Blackwell dilution that you can hardly taste. How is one supposed to enjoy grilled lamb chops for dinner without mint sauce? I got four jars of Colman's; that should last me for a few months anyway. If you're familiar with southern California, you are probably assuming that it was hotter than the hinges of hell. I mean, Pomona. Really. But, no. May and springtime in general is actually quite nice. It was a beautiful weekend in the high 70's -- you couldn't ask for better. When I remind you next year, be sure and come if you are anywhere near. I've got da miseries. . . .
. . . .consisting of a sore throat which still after several days hasn't moved either to the sinuses or the chest the way it usually does, a nuisance fever, and a cranky attitude. Uh, a crankier than usual attitude.